Good breed for a small child? Re: Good breed for a small child? Pretty in pink but wicked in spurs! Cattle Cait wrote: I'd go with a Himilayan as a first choice. I've never met a mean one and they are small and easy to handle. If for some reason you can't get a Himi, go for a Dutch, Mini Lop, or Mini Rex, in that order. I would have to give another vote for himalayan. I have never had one, but I see more himis, by far, being carried around at rabbit shows by the youngest children than any other breed. They just hang there, like ferrets. 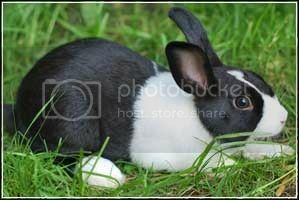 I'm thinking of getting another dwarf rabbit but I don't know what kind to get. I have a mixed dwarf right. indoor pet rabbit. my rabbit right now is a male that is not fixed. I want to get another bunny or rabbit because my youngest wants one and I think it would be fun to have more then 1. so what kind should I get? You should not get another rabbit until your rabbit is neutered. Male rabbits always fight with other males and a female will get pregnant and you could end up with 6 to 10 kits every month ! It is not easy to find good homes especially for larger or mix breed rabbits and most breeders will cull extra rabbit when they dont find homes for them rather than contribute to the rabbit over population problem. we are keeping the rabbit we have now. we just want another rabbit to. we might get lionhead & netherlands bunny that is 7 weeks old or mini rex. the mini rex are 9 days old right now so can get one after nov 5th. I have talked to a breeder about getting a Netherlands or lion head. I have deiced yet. equestrian<3 wrote: My younger sister wants to show a rabbit because I am, and I was wondering if anybody could suggest a good breed for a child? Fairly small, docile, good temperament, easy to handle? She really wants a polish or a thrianta, but that will just depend on the rabbit itself. They have medium/long soft coats but you don't actually want to comb them a lot because it will come out easily and their coat accounts for almost half their score! Just let it grow. Only comb them with a cat come very minimally before a show. We started getting them because our kids were at that time all under the age of five, with one being a baby. Now we have an 8, 6, and 3 year old who all help me at shows. The 8 and 6 year old are able to show at most shows and our 3 year old shows her rabbits at a couple of local shows that allow her to show. They do fantastic! They can make a bit of a mess of their cage because their fur makes their feces a big messier, but we just run a torch over the cage every couple of week and haven't had any problems since. They weigh about 2 pounds and are very very very docile by nature. We also have Netherland Dwarfs but they are not as calm as the Jersey's. The does do well if they have been bred though. Holland Lops are good. Very sweet rabbits if raised correctly. Also, Mini Holland Lops are smaller and also very sweet. WWRabbitry, I know you are new here and eager to participate and I understand your enthusiasm for your breed of rabbits, but please look at the dates of the topics before you post on them. This thread is is from several years ago. Flooding the site with comments on old threads disrupts the flow on RT, especially when you seem to have something to say about so many of them. Slow down just a little, please, and let us get to know you. I agree with everyone saying mini lops. They might be a medium sized breed, but they can be giant marshmallows if you handle them enough. Please get a buck though. Since they don't go into heat and such, their temperaments stay the same unless they are sick. Good luck finding you sister a rabbit! I know you're still pretty new as well, but could you please reread the comment just before yours? This thread is several years old (OP was from 2011), so chances are they made decisions long ago.